To report a case of severe corneal scarring and hyperopic shift after corneal cross-linking (CXL) for the treatment of ectasia following small incision lenticule extraction (SMILE). A 35-year-old man was referred with severe unilateral corneal haze that developed after CXL. The patient had undergone SMILE 4 years earlier in both eyes. Nineteen months postoperatively, the patient presented with bilateral decrease in vision and corneal topography revealed corneal ectasia in the right eye. CXL was performed in the right eye and a deep stromal haze was observed 1 year later. Comparative maps showed progressive corneal thinning with corresponding flattening that induced hypermetropization and astigmatism. CXL after SMILE in this original case resulted in severe deep corneal haze and corneal flattening with hyperopic shift. Small incision lenticule extraction (SMILE) has become increasingly prominent in the field of refractive surgery. Compared to laser in situ keratomileusis (LASIK), its flapless nature gives SMILE a theoretical biomechanical advantage because it may avoid the flap-related weakening of the anterior stroma. Nevertheless, the risk of ectasia after SMILE is not fully eliminated, as several case reports have indicated.1–4 Corneal ectasia following refractive surgery can be successfully managed with corneal cross-linking (CXL) with good long-term outcomes. We describe a patient exhibiting corneal haze and hyperopic shift after CXL performed for the treatment of ectasia after SMILE. A 35-year-old man was referred to our tertiary ophthalmology department with corneal scarring after CXL performed for corneal ectasia following SMILE. The preoperative refraction was −3.00 −1.25 × 50° in the right eye and −3.75 diopters (D) in the left eye. The corrected distance visual acuity (CDVA) was 20/16 in both eyes and slit-lamp examination revealed a clear anterior segment. The rest of the clinical examination was within normal limits. The patient had no family history of keratoconus and no ocular allergies or eye rubbing were reported. 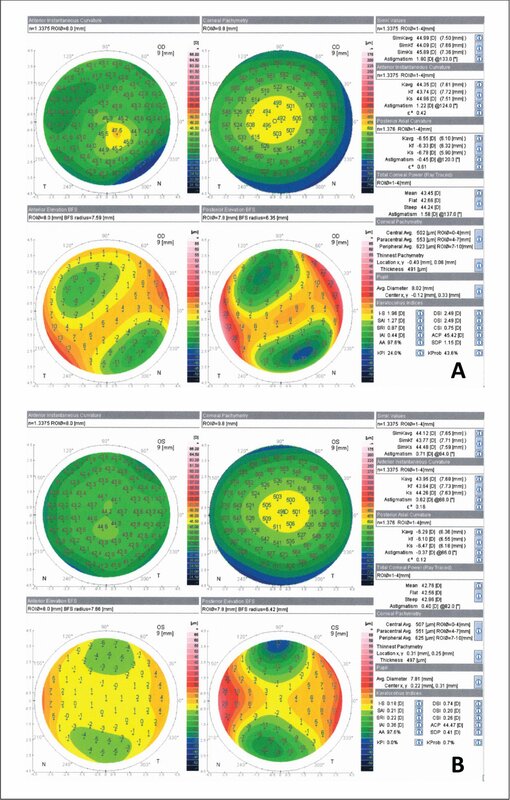 Scheimpflug-based preoperative corneal topography (Galilei Dual Scheimpflug Analyzer; Ziemer Group, Port, Switzerland) indicated subclinical keratoconus in the right eye with anterior and posterior surface keratometry values of 43.74 and 44.96 D and −6.33 and −6.78 D, respectively, and simulated keratometry astigmatism of −1.22 D at 124° (Figure A, available in the online version of this article). Preoperative Scheimpflug-based corneal topography of the (A) right and (B) left eyes showing inferior steepening with corresponding thinning in the right eye. Anterior curvature map showed a maximum keratometric reading of 47.5 diopters (D) and a thinnest corneal thickness of 491 μm coincident with posterior and relatively anterior elevation and inferior superior asymmetry of 1.96 D. In the left eye, anterior and posterior surface kerato-metric readings were 43.64 and 44.26 D and −6.10 and −6.47 D, respectively, with −0.62 D and 88° of astigmatism. Anterior curvature map showed a maximum keratometric reading of 44.60 D. The thinnest pachymetric reading in the left eye was 497 μm with an inferior-superior index of 0.18 D.
SMILE (Carl Zeiss Meditec AG, Jena, Germany) was performed in both eyes without any reported complication. The cap thickness was 120 µm and the cap diameter was 7.75 mm with an optical zone of 6.75 mm. The lenticule thickness in the right and left eyes was 98 and 84 µm, respectively, with a residual stromal bed of 280 and 299 µm, respectively, and a refractive correction of −3.50 −1.25 × 50° and −4.00 D.
Nineteen months later, the patient presented with a bilateral decrease in vision. The uncorrected distance visual acuity (UDVA) was 20/200 in the right eye and 20/63 in the left eye, with a CDVA of 20/20 in both eyes. The manifest refraction was −1.00 −2.25 × 75° and −0.75 −0.50 × 180° in the right and left eyes, respectively. In the right eye, corneal topography revealed a skewed axis irregular astigmatism with increased posterior elevation and corneal thinning (410 µm) indicating the diagnosis of iatrogenic corneal ectasia (Figure B, available in the online version of this article). Corneal topography of the right eye after small incision lenticule extraction demonstrating skewed axis irregular astigmatism with increased posterior elevation and corneal thinning indicating corneal ectasia. Two months later, CXL was performed according to the standard Dresden protocol (epithelium-off with a fluence of 5.4 J/cm2, 3 mW/cm2 for 30 minutes) with hypotonic riboflavin in the right eye and the immediate postoperative period was reported to be uneventful. One year after CXL, a deep paracentral stromal haze was noted (Figure 1). The UDVA had decreased to 20/100, correcting to 20/20, and the manifest refraction was +3.75 −2.75 × 80°. Scheimpflug imaging comparative maps showed a reduced corneal thickness at the thinnest point of 301 µm and coinciding flattening of the anterior curvature corresponding to the induced hypermetropization (Figure 2). Slit-lamp photograph of the right eye with (A) slit-illumination and (B) broad beam illumination. A deep stromal scar that developed after corneal cross-linking is evident. 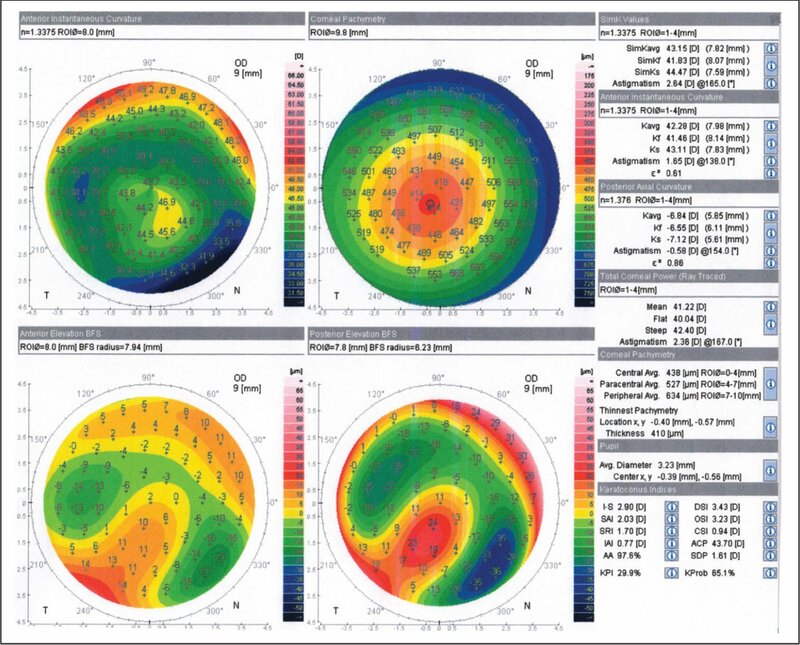 Topography maps of the right eye at (A) 13, (B) 10, (C) 8, and (D) 4 months after corneal cross-linking showing progressive flattening of the anterior curvature. 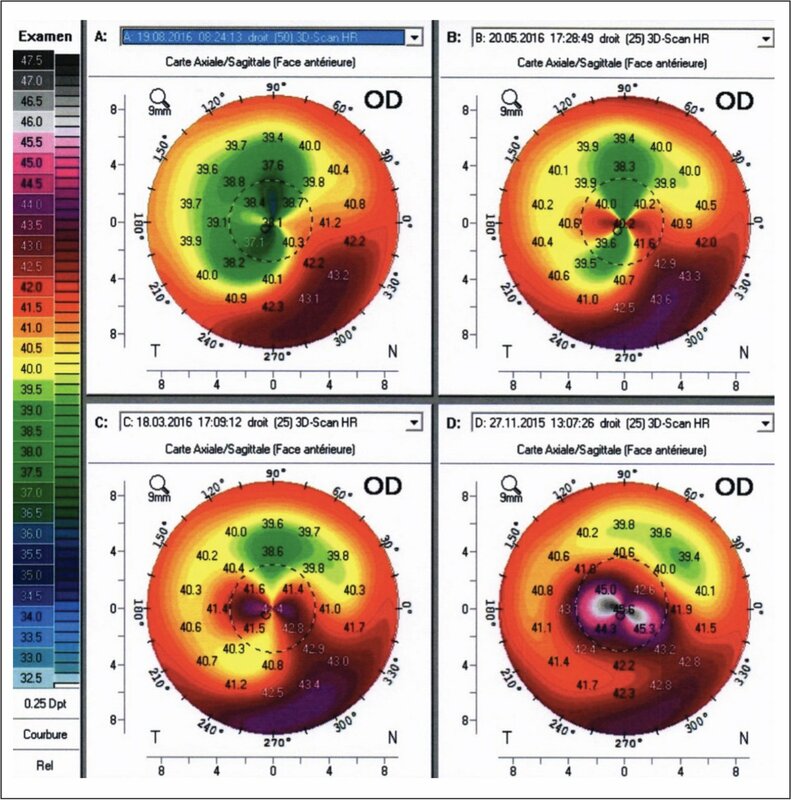 To our knowledge, this is the first report of corneal ectasia after SMILE treated with CXL with significant haze formation and hyperopic shift. Four cases of ectasia after SMILE have been reported in the literature.5 Three of these patients exhibited subclinical keratoconus preoperatively with abnormal topographies.1,2,4 One case described corneal ectasia with normal preoperative topography.3 The mean time to diagnosis was 6.4 months. One of these cases was managed with intrastromal corneal ring segments implantation combined with CXL and reported improvement in the CDVA and manifest refraction.3 A second case developed iatrogenic ectasia after a photorefractive keratectomy treatment following initial SMILE. He was treated by CXL and later developed corneal haze.2 In the other two cases, management was not mentioned. None of these cases was treated with CXL alone. CXL is a minimally invasive procedure that has been previously adopted for the stabilization of ectasia following laser refractive surgery, demonstrating good long-term outcomes. Corneal scarring is commonly identified as a potential complication of CXL treatment in patients with keratoconus. In a prospective study by Koller et al.,6 a 2.9% incidence of stromal scars with coincident flattening in the topography map was noted. Advanced keratoconic stages indicated by high keratometric readings in the preoperative corneal topography, thinner corneas, and the presence of reticular hyporeflective microstriae in the preoperative in vivo confocal microscopy have been suggested as predicting factors for permanent haze formation after CXL.7,8 However, deep, persistent stromal scarring has also been observed in patients with mild keratoconus.9 Moreover, a case of temporary subepithelial haze that resolved with topical steroids has been reported,10 but evidence remains contradictory with regard to the effect of steroid treatment on haze evolution. Multiple variations of CXL methodology have been introduced to optimize the outcome after CXL. In our case, the standard Dresden protocol was applied with the administration of hypo-osmolar riboflavin instead of iso-osmolar riboflavin solution to induce corneal swelling because of the preoperative minimum corneal thickness of 410 µm. The formulation of the riboflavin solution, such as the containing carrier, could theoretically be correlated with haze formation after CXL. The hypo-osmolar riboflavin solution used in our patient consisted of pure riboflavin 0.13% in aqua, thus eliminating the possible impact of the dilution substances in this case. Furthermore, Raiskup and Spoerl13 investigated stromal scar development after application of hypo-osmolar riboflavin on thin keratoconic corneas and suggested that artificial swelling of the cornea with hypo-osmolar riboflavin may prevent stromal scar formation. Moreover, in a study on corneal haze evolution associated with CXL, Greenstein et al.11 reported no difference in densitometry measurements between eyes treated with hypotonic riboflavin and those treated with isotonic riboflavin. Corneal scarring after CXL for iatrogenic ectasia after LASIK has not been thoroughly studied in the literature. The nature of each procedure may affect the wound healing and deformation response after LASIK and SMILE. The interface created after the lenticule extraction in SMILE may affect corneal healing during CXL irradiation. The lenticular interface is close to the CXL-induced stromal demarcation line in SMILE, whereas it is superficial in LASIK. This could indicate a possible mechanism underlying the scarring observed in the current case because SMILE involves the deeper stroma. Our hypothesis that SMILE might predispose to haze development after CXL could be further supported by the above-mentioned case report by Mattila and Holopainen2 The authors reported haze formation in a patient following SMILE, photorefractive keratectomy enhancement, and CXL; thus, scarring cannot be safely attributed to SMILE because of the additional photorefractive keratectomy. Yet in this case, the possible impact of SMILE in haze formation after CXL cannot be omitted. Our case underlines the potential of corneal scarring after CXL in patients with ectasia after SMILE. SMILE could be inherently associated with an increased risk of corneal haze formation compared to LASIK, and thus might also affect the outcome of CXL for the treatment of ectasia after SMILE. This remains to be proven by prospective studies of such patients. Nevertheless, we emphasize the importance of cautious evaluation after CXL of patients presenting at-risk corneas and propose that thorough patient education regarding the risks of the procedure and the postoperative long-term steroid treatment should become an indispensable part of the patients' follow-up. Razmjoo H, Rahimi B, Kharraji M, Koosha N, Peyman A. Corneal haze and visual outcome after collagen crosslinking for keratoconus: a comparison between total epithelium off and partial epithelial removal methods. Adv Biomed Res. 2014;3:221. From the Ophthalmology Department, University of Lausanne, Jules Gonin Eye Hospital, Lausanne, Switzerland (NV, GAK, AS, DT, GDK); the 23rd University Department of Ophthalmology, AHEPA Hospital, Thessaloniki, Greece (DM); and the Ophthalmology Department, Faculty of Medicine, University of Crete, Heraklion, Greece (GAK).